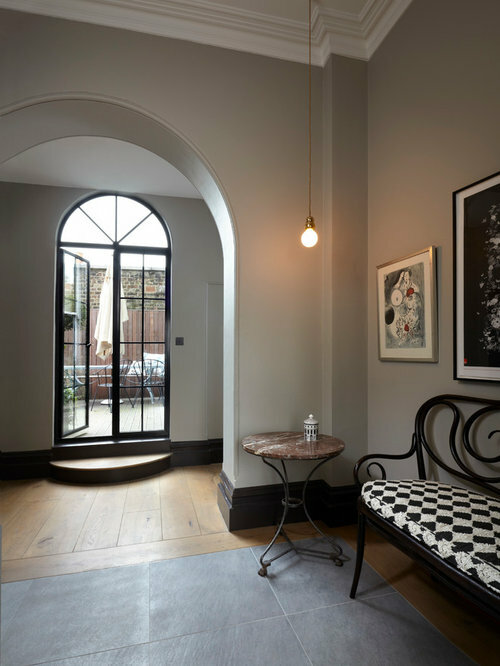 In this West London Mansion Flat the client wanted to achieve the feel of 1930's Vienna. 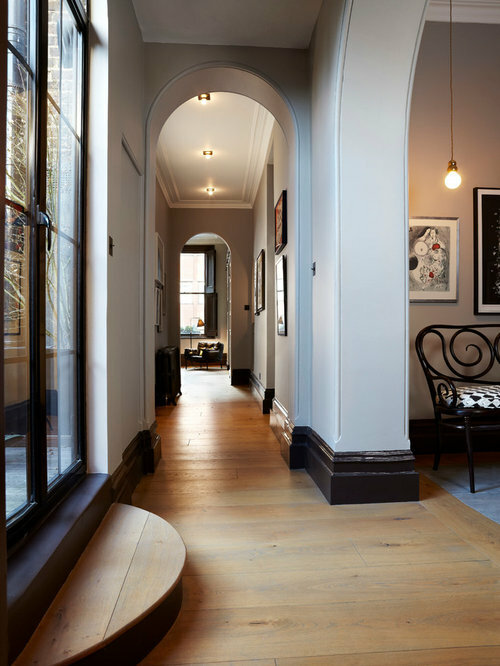 This was achieved through a muted grey scale, with dramatic dark woodwork to contrast and plenty of vintage touches. 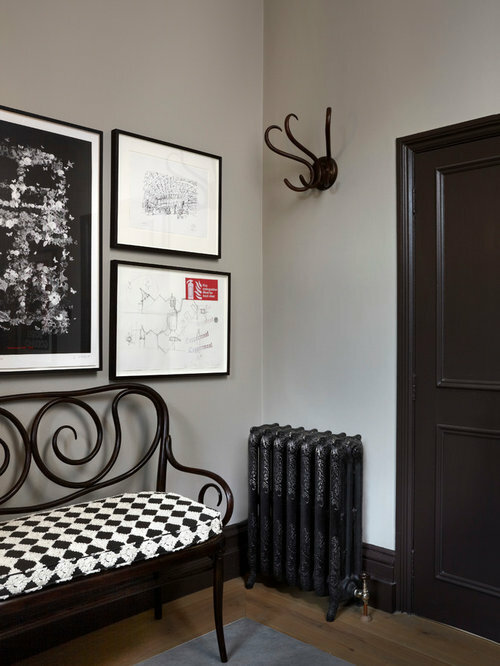 The main feature of the entrance is a vintage Thonet bench upholstered in a checkered black-and-white fabric.The walls are painted in Sure Grey from the Damo collection, available at Sigmar. The woodwork is Cocoa, also from Damo. A view from the entrance towards the living room. 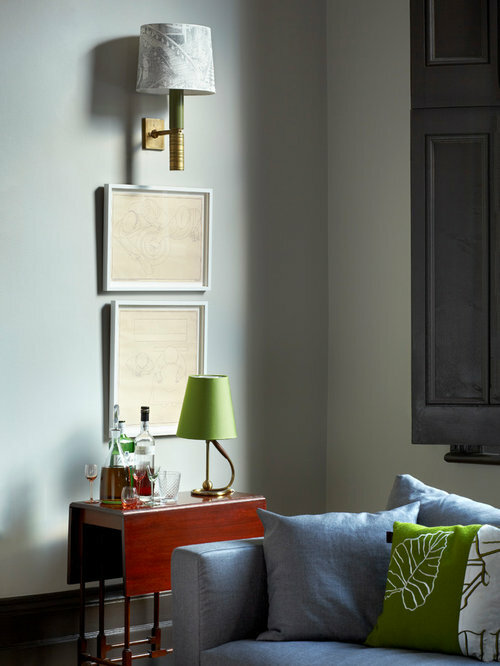 The walls are painted in Sure Grey from the Damo collection, available at Sigmar. The woodwork is Cocoa, also from Damo. A detail from the living room in which the accent colours of the room are picked up on. The walls are painted in London Cloud from the Damo collection, available at Sigmar. The woodwork is Cocoa, also from Damo. Detailed view from living room. The walls are painted in London Cloud from the Damo collection, available at Sigmar. The woodwork is Cocoa, also from Damo. The dining room generously opens up to the living room allowing a flow between the rooms. 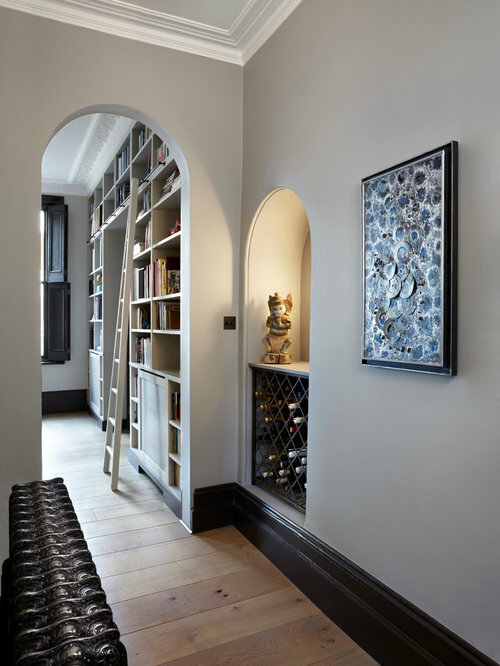 The colours in the two rooms correlate to create a link through the flat. The walls are painted in Sure Grey from the Damo collection, available at Sigmar. The woodwork is Cocoa, also from Damo. 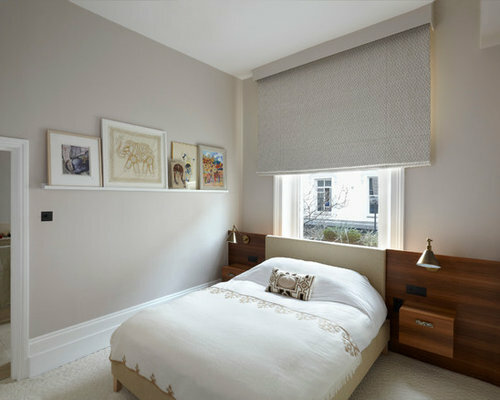 In the bedrooms you can afford to break off from the dark woodwork in the rest of the flat and go for a more traditional white. The walls are painted in Lazy Bird from the Damo collection, available at Sigmar. 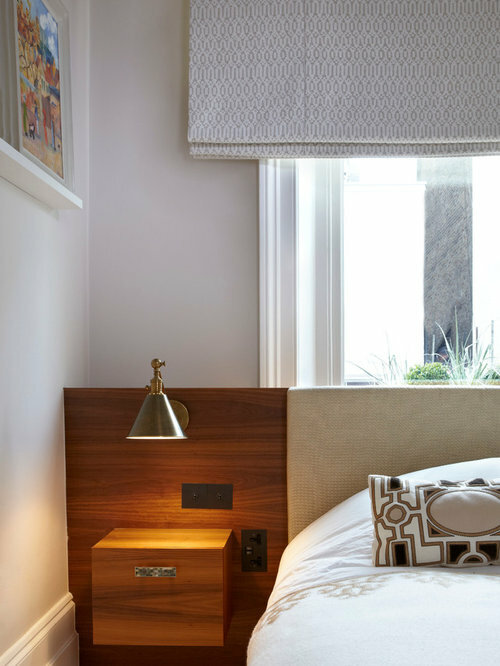 A detail of the bedside table from the bedroom. The switches are built into the bed and are completely flush. The walls are painted in Lazy Bird from the Damo collection, available at Sigmar. 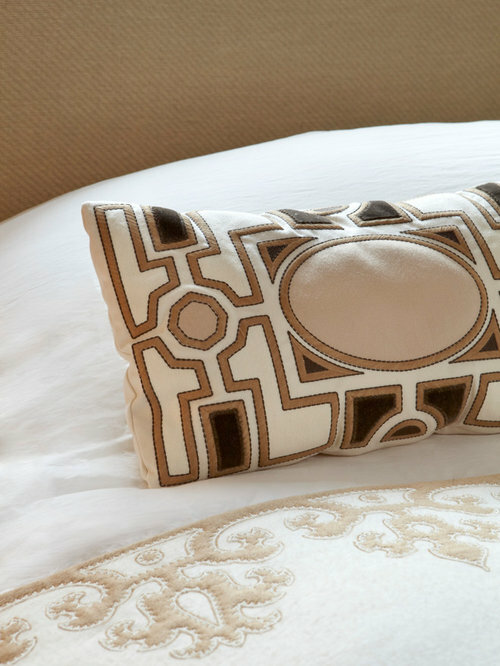 A beautiful detail from the master bedroom. 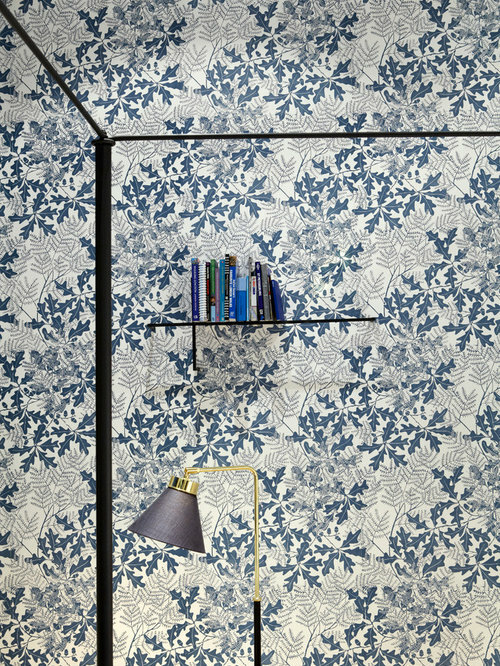 The bedroom is wallpapered in Marthe Armitage's oak leaf in a custom blue. 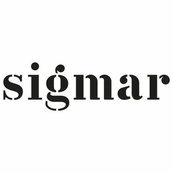 The ladder is custom, as designed by Sigmar. A detail from the master bedroom. A small shelf hold a selection of books next to an armchair. The master bedroom is wallpapered in Marthe Armitage's oak leaf in a custom blue. The walls are painted in Sure Grey from the Damo collection, available at Sigmar. The woodwork is Cocoa, also from Damo. Toilets are a place for being expressive. 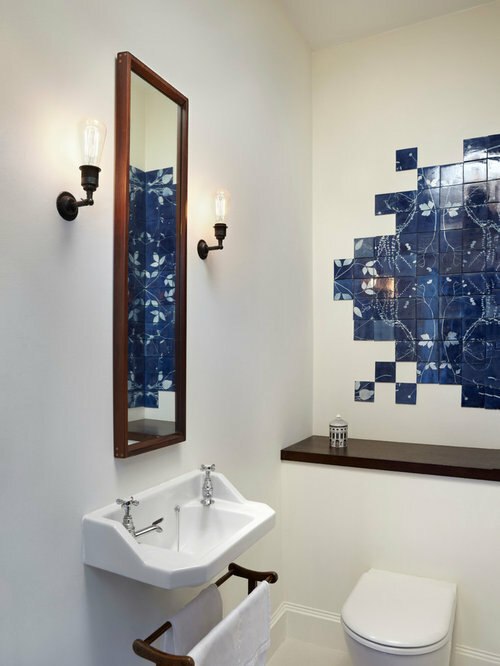 In this small space the beautiful blue tiles break off an otherwise all white bathroom.